Disney is in tough times. It's 1942, and a war is raging in Europe, closing the international market to movies such as Bambi and Fantasia, movies in dire need of money to offset their budgets. But since the world is at war, America is in need of a better outlook on the world and in comes federal money to send Walt Disney to South America with a group of artists to do a good relations press tour. Out of this trip comes two films: Saludos Amigos and The Three Caballeros, the first of which I will discuss here. 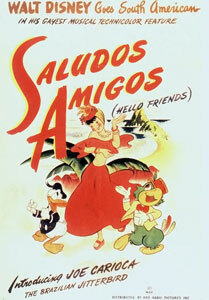 Saludos Amigos is partly a collection of short cartoons, and partly a documentary. Introducing each of the four short cartoons is footage of the people and sights of each nation visited. 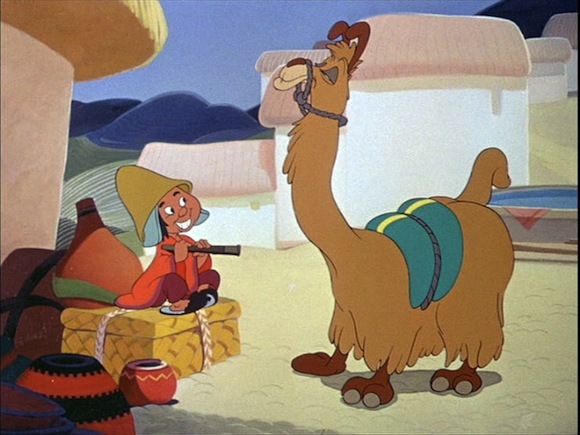 It begins with a short entitled "Lake Titicaca," featuring Donald Duck exploring Peru as an American tourist. We then travel to Chile and watch "Pedro," a cartoon about a little mail plane on his first flight. 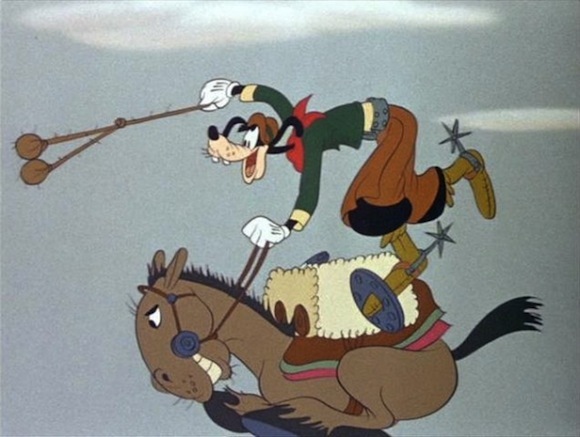 Then the team travels to Argentina where we meet the gaucho, prompting "El Gaucho Goofy," where Goofy as an American cowboy learns how similar he is to the Argentinian rancher. Finally, we reach Brasil and see "Aquarela do Brasil", and Donald meets the new character José Carioca and learns the samba. But is saying "hello" ineffective? It seems like a good place to start, and this joint project between the two Americas seemed to at least bring many smiles to faces in a difficult time. While not a perfect attempt, Disney was able to provide what it always has through its cartoons: hope, laughter, and a reminder that everything is going to turn out ok.
What do you think? Were Walt's attempts at artistic diplomacy too heavy-handed? Or is their merit in his methods? Chime in below, I'd love to hear what you think! 1. Richard, Alfred Charles Jr., Censorship and Hollywood's Hispanic Image: An Interpretive Filmography, 1936-1955, (Westport: Greenwood, 1993), 274. 2. Bernice Nuhfer-Halten, “Beyond the Ratoncito: Disney's Idea of Latin America,” in Learning from Mickey, Donald and Walt: Essays on Disney's Edutainment Films, ed. A. Bowdoin Van Riper (McFarland & Company, Inc, 2011), 209.